In recent years the celebration of Cinco de Mayo has become quite popular in the United States. So, if you are looking for something to make for Cinco de Mayo on Saturday, these are definitely my suggestion. They have some traditional Mexican flavors that also just happen to be flavors that make me think of summer, which is just around the corner. These tacos are topped with a jalapeno coleslaw, which would also be tasty on the side or served with an entirely different dish. The coleslaw has quite a bite to it so if you would prefer it a little tamer, just reduce or even eliminate the jalapeno. If you like pepper without the heat, try substituting bell pepper. Red or yellow bell pepper would even add to the appearance. I used corn tortillas just because I like them, but you could also use flour tortillas. In the photos it is served with black beans and corn. This is not really a recipe, but I will include it because it really is a good compliment to the tacos. Note: Please be careful chopping jalapenos. I recommend using gloves because they can irritate you hands pretty badly and that is not even the worst of it. If you were to forget and touch your eyes, it could be really bad. You can buy pre-chopped or shredded cabbage if you want. I chop my own by slicing it thinly in one direction and then the other. It really doesn't take long and fresh really does taste better. Stir together all ingredients until well combined. Refrigerate while you finish the tacos. Season shrimp with salt, pepper, and chili powder. Heat olive oil in a large skillet over medium. Add seasoned shrimp and saute until opaque being careful not to over cook. Squeeze lime juice over shrimp.Place tortillas on a microwave save plate between two damp paper towels. Microwave on high about 1 minute or until heated through. 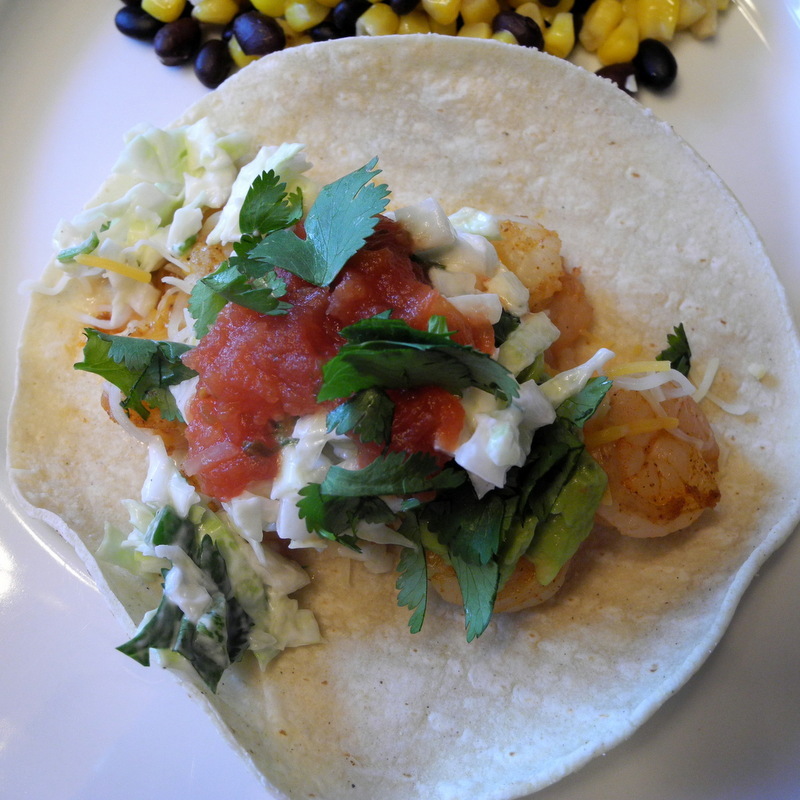 To assemble tacos, place shrimp, jalapeno coleslaw and any other desired toppings on a warm corn tortilla. Fold the sides to be able to pick up and eat. Heat oil in a large skillet. Saute corn and garlic until the corn is tender. Stir in the black beans, salt, and pepper cook until heated through. 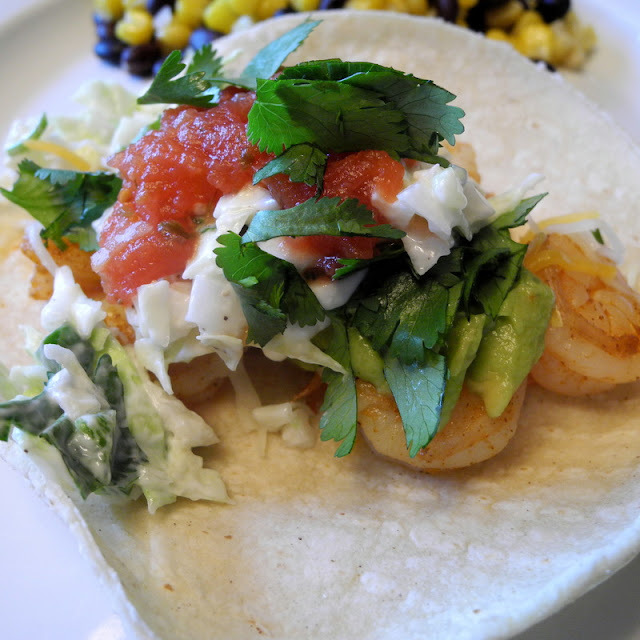 Shrimp taco do make for a great meal. Also they are a lot lighter than beef. Your picture sure does make me want some. I have never had jalapeno cole slaw, but that will change. The side of the black beans and corn does compliment the dish quite well. Have a great day!